Lukaku and Mbappé have the potential to become the starcast of the GOAT debate in the post Cristiano Ronaldo-Lionel Messi generation. What’s more, we might even see them step on to the pedestal in Russia, in 10 days or so, leaving an indelible mark on football’s illustrious timeline. History could be made by the two European footballers of African descent -- born to immigrant parents, and taking up football, like most second generation migrants, as a path to a better life. 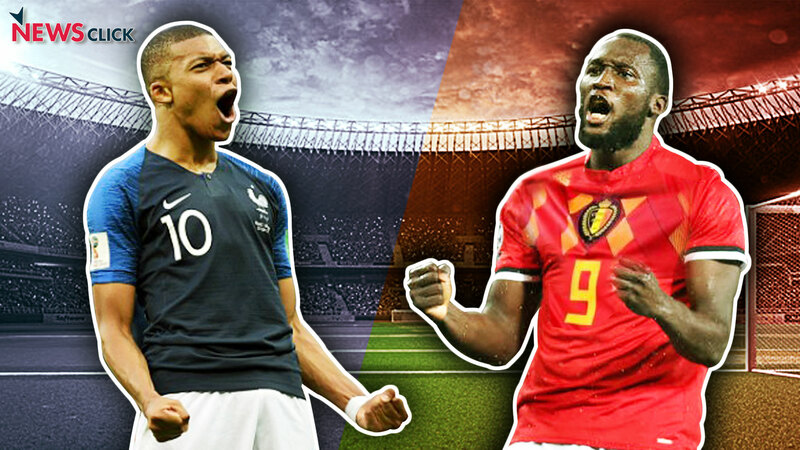 By reaching Russia, or rather in their case, taking their national teams to Russia, Mbappé and Lukaku have become the faces of the irony that football presents, in sharp contrast to the anti-immigration sentiments doing the rounds in western Europe these days. France and Belgium would not have been in Russia in the first place, if not for the two stars -- Mbappé and Lukaku -- and the rest of the key players of “foreign” origin in the squads, which going by percentage ironically, is a gross misrepresentation of the actual population. In France, immigrants make up 6.8% of the country’s population but they are 78.3% of the French football team. Almost half of Belgium’s (47.8 %) players in the World Cup squad are of African origin, while their share in the country’s population is 12.1%. Things are similar for other European countries -- England, Spain, Switzerland and Germany. All of them have a sizeable percentage of immigrant talent in their football squads, much higher than their share in the total population. This was best put forth by Lukaku in his write-up at the playerstribune.com, where he spoke about how his fellow Belgians want him to fail. Lukaku, the proud footballer, pleads here for recognition when he repeatedly says he is “Belgian”, and here lies the social dilemma that Belgium and Mbappé’s France face when it comes to accepting immigrant “heroes” -- on the sporting arena or any other field -- as national symbols. And it has to do with their colonial histories, which takes us back to the country of origin of these two players -- Congo for Lukaku, and in the case of Mbappé, his football coach father was from Cameroon, and his mother a former handball player of Algerian origin. Yes, French sport and Algeria have a deep connection after the great Zinedine Zidane led the football team to the World Cup in 1998. Interestingly, even the great Zidane was not immune to the flip-flop that Mbappé and Co. as well as Lukaku and pals across the border face, especially when they lose. Zidane was reportedly termed an “Algerian” when he couldn’t see France through to the knockouts in the 2002 edition, and his ethnicity was further highlighted after the headbutt in the World Cup final against Italy in 2006. Eight years prior to that, he was a French hero, a symbol of successful integration of immigrants into mainstream society. The “Algerian” Zidane, the half Cameroon-half Algerian Mbappé, and the “Congolese” Lukaku are remnants of a colonial past and related atrocities that neither France nor Belgium can ever be proud of. But sadly the societies still hold on to some ghosts from it, using them as yardsticks to measure success and failure, especially failure. In 1958, a mere few months after Brazil broke their World Cup hoodoo, and a young superstar emerged on the world stage, Brussels hosted the World Fair. Expo 58 was a 200-day event celebrating the post-War advances made by European nations. Each nation was assigned a pavillion. The pièce de résistance was Atomium, a giant model of a unit cell of an iron crystal. The futuristic landmark is now a museum. Conveniently forgotten, though, is another display in the Belgian pavilion: a display of Congolese men, women and children in a “village scene” put on for the education of white visitors. It was dubbed and lambasted as the world’s last “human zoo”. Again, some perspective! In 1958, when Pele became the first black superstar football had seen, Belgium was hosting a pavillion at the World Fair, with actual human beings as exhibits. But in fairness to the Belgians, this was probably the least of the atrocities they committed against the people of Congo, in their century-long colonial brutality in Africa. Typically, for any colonial power, the remnants of their rule lingers on in Brussels. The Tervuren Museum on the outskirts of the capital is styled like the British Museum, a space which houses an enormous collection of cultural relics from Congo. The biggest of the ‘Congo Horrors’ was the labour policies enacted to collect natural rubber for export. King Leopold II’s control in the Congo Basin exceeded 2,600,000 square kilometre. Initially, the colony proved unprofitable and insufficient, with the state always close to bankruptcy. Soon, the administration nationalised all uninhabited land, and seeing the demand for rubber increase in Europe, distributed it to private companies for harvest. The companies were rarely regulated and free to do as they pleased, and almost all used forced labour and violent means to gain profit. Together with these atrocities, disease and famine caused a massive decline in population. Sources differ on exact numbers but estimates put the decline in population between one and 15 million. By the time the World Fair was on in Brussels, the worst of the Congo horrors had passed, and Belgium had officially annexed the territory, therefore suppressing forced labour and bringing in stricter laws. Despite the improvement in the living conditions of the population, the annexation made little difference to their free will. The time they were exhibited at the World Fair -- a total of 598 people, 273 men, 128 women and 197 children -- aside from the wonderment at seeing an ‘indigenous’ population live, the main conversation centred around what such a high number of Congolese men and women in Belgium might do. Make their football teams better, we can confidently answer now. The area was first colonised by Germany in 1884, when present-day Cameroon and adjoining areas was annexed as Kamerun. The Germans, after facing resistance from the natives, and finding local workforce hard to find, instigated forced labour in Kamerun to build railway and other infrastructure that would help them build an efficient network to mine the country, quite literally. France came into the picture in 1911, when it ceded nearly 300,000 square kilometre of territory from French Equatorial Africa to Kamerun in 1911, following the Treaty of Fez after the Agadir Crisis. The area came to be known as Neukamerun. In World War I, the British invaded Kamerun from Nigeria, and, after the war, the colony was split between the United Kingdom and France, which took control of Neukamerun and began its rule over French Cameroon from Yaoundé. After the Second World War, movements started within French Cameroon for independence. In 1956, the outlawed Union of the Peoples of Cameroon (UPC), comprising Bamileke and Bassa ethnic groups, began an armed uprising which continued until independence in 1961. In 2015, then France president François Hollande acknowledged his country’s controversial role in the genocide of Cameroon’s Bamileke ethnic group. He admitted that French forces tried to quash the independence movement in the 1950s, committing some harsh crimes. The French forces were responsible for the massacre and exile of leaders of the UPC, which they had banned in 1955. The exact death toll is still unknown but experts believe it may range from 100,000 to 400,000 people between 1959 and 1964. In the department of Sanaga maritime alone, populated by Bamileke ethnic group, 120,000 people were killed in 1960. The bloody repression lasted until 1971 but it was never acknowledged by French authorities till 2015, when Hollande issued his statement. The delay in at least standing up and admitting to the atrocities is an indicator as to how mainstream France is still struggling to provide an egalitarian platform for the immigrants from its colonial past. Belgium is not far behind either. Lukakus and Mbappés, meanwhile, play, at times, trying to shake off burdens from historic injustices that turn up to taunt the best of them in subtle forms even now.